It looks like ATI is in hot water with their video cards that supposedly support HDCP, but really don't. "A CLASS action has started in the USA alleging that ATI Technologies' graphics cards don't support HDCP although it claims they do. A filing made by Stanley Batsalkin and Kenny Vargas on behalf of themselves and others in a San Jose district court alleges ATI Technologies, ATI Technologies Systems, ATI Research Silicon Valley, ATI Research and 200 "John Does" breached state consumer protection statutes, express warranty statures, implied warranty statutes, negligent misrepresentation common laws and unjust enrichment common laws." At the wallet emptying prices of $499 and $599 I think SONY has gone cookoo in regards to price and the rip of the Nintendo Wii controller. "Sony (Research) also revealed a key feature of its new controller, showing a functionality that appears very similar to the one Nintendo will offer with the Wii, its new system. While the controller looks virtually identical to the current PS2 controller, user wrist movements can also be translated into onscreen movement - "but it's based upon our industry standard controller, which has been enjoyed by so many gamers," said Phil Harrison, president of Sony Computer Entertainment Worldwide Studios. Nintendo shrugged off the similarities, with a spokesperson saying "imitation is the sincerest form of flattery"." Gaming | Nintendo DS Lite shipping June 11th! N-gamers rejoice! 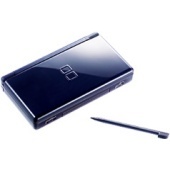 The DS Lite is coming in a month! "In a move that is in no way shocking, Nintendo has finally announced that it will be releasing the DS Lite -- the slim (and gorgeously illuminated) replacement for the original DS system -- in the U.S. Sure, it was a given, and we knew it would be a big part of our E3 Coverage, but at least we have the details now. Contrary to most speculation, the Lite won't be arriving hand-in-hand with the highly-anticipated New Super Mario Bros.. Where Mario's latest adventure streets less than two weeks, the Lite's slated to hit the stores June 11. Furthermore, the tantalizingly sleek Enamel Navy color scheme won't be shipping then, nor will the widely reviled light blue version. Rather, the first batch of Lites will consist entirely of the Polar White model. (Which, it should be noted, still looks damn good.) "
Want to be like Tom Cruise in Minority Report and move things around on the screen with your hands? Just visit O'Hare Airport in Chicago. "NEW YORK (AdAge.com) -- Starting today air travelers passing through Chicago's O'Hare Airport terminal 3 will be able to impersonate Tom Cruise's character from "Minority Report" and use their hands to manipulate content -- weather, news, Tiger Woods' greatest putts -- on a giant 10-by-7-foot screen. The interactive news screen, which will soon be unveiled at New York's Kennedy airport as well, comes via Accenture (hence, the Tiger Woods connection) and the company is lauding it not only as revolutionary for out-of-home advertising, but also for in-office collaboration. And its resemblance to the movie, set in the year 2054, is no coincidence." Next time you shop at Wal-Mart, you may be able to buy computer components along with your cotton balls and soda. "CHICAGO (Reuters) - Wal-Mart Stores Inc. (NYSE:WMT - news) will start selling build-your-own-computer components in more than one-third of its U.S. discount stores this month as it looks for ways to tempt shoppers to buy more than just low-margin food. Wal-Mart currently offers only prepackaged bundles of personal computers and accessories in most of its stores. With the build-your-own-computer counters, shoppers can choose between several different components. Such components include central processing units -- the brain of the computer that powers its basic functions -- as well as monitors, keyboards and mice that customers can combine to create customized packages they can load in a shopping cart and take home right away." Internet | Vatican's very own MySpace clone? It seems the team behind the Vatican website are hard at work creating a MySpace clone for Catholics.
" Now Sister Judith is creating a second Vatican Web site, set for launch in the fall, that is aimed at bringing together the faithful so they can interact. Think of it as MySpace.com (NWS ) for Catholics. There will be personal news updates, e-learning programs, and areas set aside for families, young people, and parishes. Collaboration is key, and that should differentiate the site from others in its genre. "People will be able to find each other and work together online, and then go back and use what they have learned or done in their own communities," says Sister Judith." Some light reading for you folks. XTracPads Ripper XXL @ techPowerUp! The Nintendo Revolution name is no more! Nintendo has finally announced the new name of their console, Wii. Pronounced "we", it's a step towards even more mystery surrounding this new system. "Nintendo has finally announced the system's name -- Wii, as in "we," symbolizing the all-inclusive nature of its design -- yet much remains unknown about the GameCube's successor. Its unconventional design has (unsurprisingly) polarized the videogame community. For some, Wii is proof that Nintendo has finally gone off the deep end; others are predicting that it will be the key to ushering in a gaming renaissance. A revolution, even. Wii's mysteries makes its place in the upcoming hardware wars difficult to predict, but that only seems to add to its intrigue. Microsoft's Xbox 360 has been available for half a year now, and Sony has offered gamers a solid idea of what the PlayStation 3 will offer. Yet outside of a few closed-door demos, only a few seconds of concept footage have been made available to give a sense of what the Wii will be like in action. " Read the entire story at 1UP. "After two years and thousands of hours of investigation in conjunction with law enforcement agencies in China, Taiwan and Japan, the company said it had uncovered something far more ambitious than clandestine workshops turning out inferior copies of NEC products. The pirates were faking the entire company. Evidence seized in raids on 18 factories and warehouses in China and Taiwan over the past year showed that the counterfeiters had set up what amounted to a parallel NEC brand with links to a network of more than 50 electronics factories in China, Hong Kong and Taiwan." MS is going to be handling email for 72 colleges in the near future. The new Windows Live@edu service, which will mimic Hotmail, but with the school's domain. "The e-mail service provides a familiar interface to many students as it is patterned after Hotmail. However, students do not receive a hotmail.com or msn.com e-mail address, as the accounts it carry the domain of their respective school. The move is intended to promote the Windows Live suite of services, and also establish continuing loyalty. Although the Live services are traditionally advertiser supported, Live@edu accounts would not show ads to users while they are in school. Microsoft does, however, reserve the right to turn on the ads after they graduate."